Roger played football in 3 decades (1976-1992) for the Saskatchewan Roughriders setting the team record playing in 271 games on the offensive line primarily as a guard. An immensely popular player during his time in the CFL, Aldag was a local product from Gull Lake, SK, and was named a Western All Star 8 times. He retired before the 1993 season and is considered one of the leagues most outstanding players and solid lineman to play the sport. Roger’s fondest memory is winning the Grey Cup with the Roughriders in 1989. 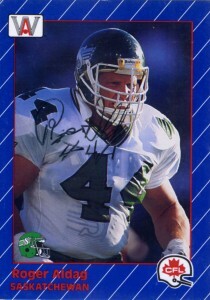 A road grader, he won the CFL’s Offensive Lineman of the year award twice, was inducted into the Roughrider Plaza of Honor in 1993, he had his number retired and was inducted into the CFL HoF in 2002. Aldag was also named #32 on the CFL’s top 50 players list. Currently Roger works for Trans Gas/Sask Energy in Regina as head of the Land Services division, is a proud season ticket holder of the Roughriders and is a rabid football fan, taking in college, and high school games when he can.